Imperfectly Painted: Revlon Tropical Temptation..Take me away!! Let's now all imagine ourselves on a beautiful tropical island. The sun is shining the the weather is warm and their is a slight cool breeze in the air. You're sitting in a lounge chair on white sandy beach under palm tree and out in distance you see miles an miles of the turquoise blue ocean. You look down at your nails and what color are you wearing? If I was in that amazing location I'd be wearing Revlon Tropical Temptation. I think it's the perfect shade and with the name like that you couldn't go wrong. 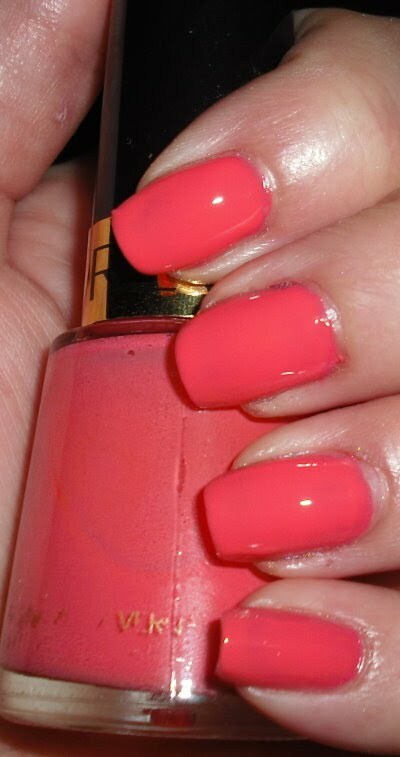 Tropical Temptation is a pink-toned coral creme. It is truly a great creme. The color makes me think of a mango/papaya/pineapple daiquiri I'd definitely be sipping on in that chair on that beach. This is one of my favorite corals almost tied with Finger Paints Coral Collage. I believe this one was originally limited edition, but made it into their coreline. I highly recommend this color to have in your stash! What are some of your favorite beachy shades or shades that make you think of a tropical getaway? I'm off to Vanuatu in about 6 weeks (not that I am counting or anything) and already know which polishes I am packing. It's winter here, so I like to wear summery corals on my toes. I think it keeps them a little warmer.